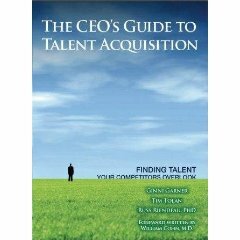 “The CEO’s Guide to Talent Acquisition” is an engaging, lightning -fast, insightful book in stark contrast to the overstuffed business tomes lining book shelves today. Heavy on practicality, easy to pack in your carry-on bag, this field guide delivers profitable ideas that you can implement between the time you take off from Hew York and land in Atlanta. This book delivers the metrics and insights to secure top talent now. Messengers Tolan, Garner and Riendeau combine their collective experience of 110, 000 interviews to deliver real world ideas with a steady dose of humor and storytelling flair for hurried executives. Purchase this title from Amazon.com today!